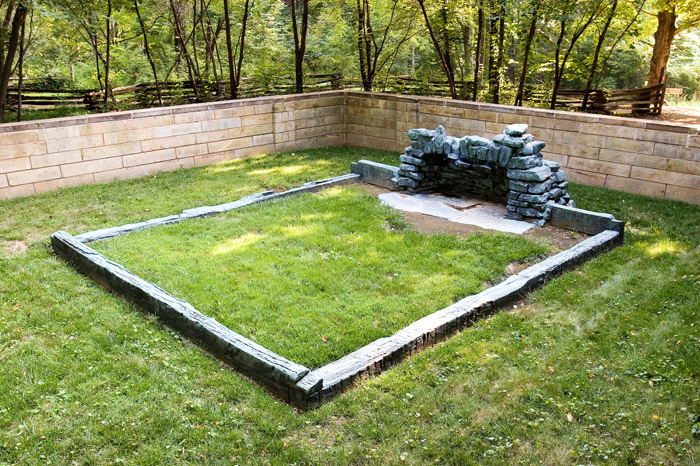 Built on the site where Thomas Lincoln’s family lived from 1816 to 1830, the Lincoln Boyhood National Memorial commemorates President Abraham Lincoln’s formative years in Indiana. While Lincoln was born in 1809 in Kentucky and established his political career in Illinois, he spent much of his childhood in Indiana. In 1816, his parents Thomas and Nancy Lincoln moved from Kentucky to a plot of forested land in what became two years later Spencer County, Indiana. From age seven to twenty-one, Abraham Lincoln lived in the same log cabin, first with his father, his sister Sarah, and his mother Nancy. A skilled carpenter, Thomas built the family’s log cabin and soon established himself in the growing community of Little Pigeon Creek. The farm eventually grew to include crops of corn, wheat, and oats in addition to the sheep, hogs, and cattle. Two years after settling, Abraham Lincoln’s mother died from “milk sickness.” Approximately a year later, Thomas remarried, adding Lincoln’s stepmother (also named Sarah) and three stepsiblings to the home. Fortunately, Sarah treated Abraham and his sister Sarah kindly and raised them as her own. Ten years after the death of his mother, Lincoln’s sister Sarah died during childbirth. Coming of age in the Little Pigeon Creek Community in Spencer County, Indiana, Abraham assisted his aging father with chores around the farm, while sporadically attending school for a short time. However, he loved to read and was very inquisitive. These skills would prove beneficial later in his life. The Lincolns remained in Indiana until 1830 when for various reasons, they relocated to Illinois, the state Abraham called home for the next 30 years. There, he started his political career. He ran for the state legislature but lost. In the meantime, he worked as a store keeper, post master, and surveyor while studying law. In 1834, Lincoln was elected to the legislature and by 1837 he had moved to Springfield, the new state capital. While there, he met Mary Todd. The couple married in 1842. Following a term in Congress, Lincoln returned to Illinois to practice law. He was becoming more well-known, especially for his impassioned speeches. Despite an 1858 loss to Stephen Douglas for a position in the Senate, Lincoln was nominated to the Presidency in 1860. When he took office in 1861 the country was facing imminent war. The Civil War lasted throughout Lincoln’s first term in office and was nearing its end when he was re-elected in 1865. However he did not get to see the country reunited for long. The Confederacy officially surrendered on April 9, 1865 and Lincoln was shot on April 14, 1865 and died the next day. With Lincoln’s death, one might assume that his childhood home would be memorialized. However, this was not the case. By the late-nineteenth century, the site’s link to Lincoln was all but forgotten, as the original Lincoln cabin was demolished years earlier. But, after the discovery of Nancy Hanks Lincoln’s grave in 1879 and the location of the Lincoln cabin’s foundation in 1917, an interest was revitalized in Lincoln’s connection to Indiana. The Indiana Lincoln Union, a group of concerned residents, formed in 1926 and began fundraising efforts. By 1930, they had gathered almost $230,000. With this money a memorial to Nancy Hank Lincoln was created including an allée leading to her grave designed by Frederick Law Olmstead. A series of bas-relief limestone panels by E. H. Daniels cover a memorial building. A trail of stones from twelve important buildings in Abraham Lincoln’s life was included as well. 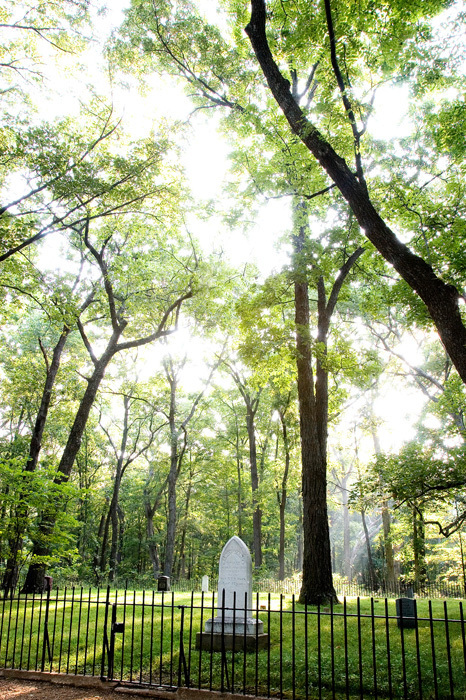 Lincoln State Park, part of Indiana’s state park system, opened in 1932 and included Sarah Evans Lincoln’s gravesite and the land formerly part of Thomas Lincoln’s homestead. 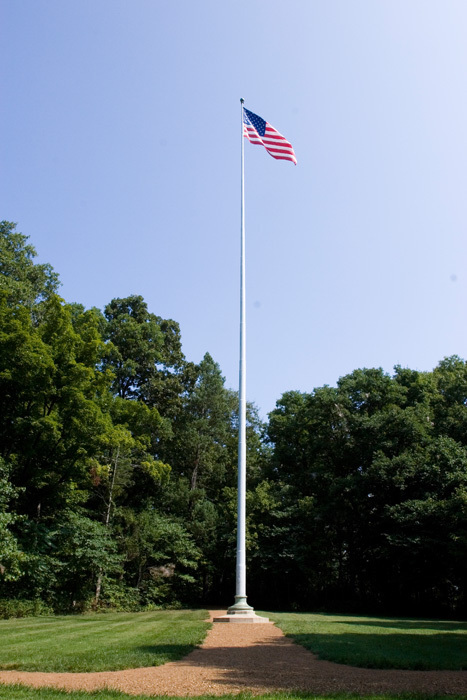 In 1962, nearing one hundred years since Lincoln’s assassination, the National Park Service named Lincoln Boyhood Home a United States Presidential Memorial and assumed responsibility of the site’s administration and interpretation. The cabin was rebuilt on the site of the original one which was located after archaeological excavations. The park also expanded to include a replica 1820s farm showing techniques central to farming in southern Indiana during Lincoln’s time. 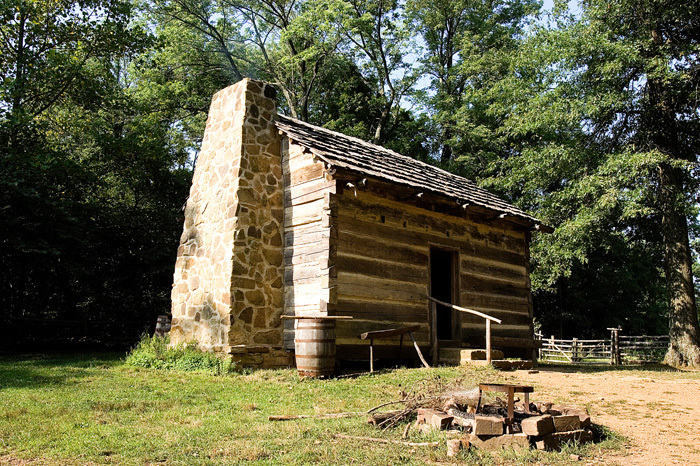 The Lincoln Boyhood National Memorial was listed on the National Register of Historic Places in 1966 and is also a National Historic Landmark. 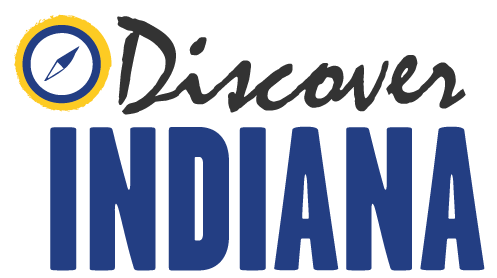 Indiana Division of Historic Preservation and Archaeology, “Lincoln Boyhood National Memorial,” Discover Indiana, accessed April 25, 2019, https://publichistory.iupui.edu/items/show/231.